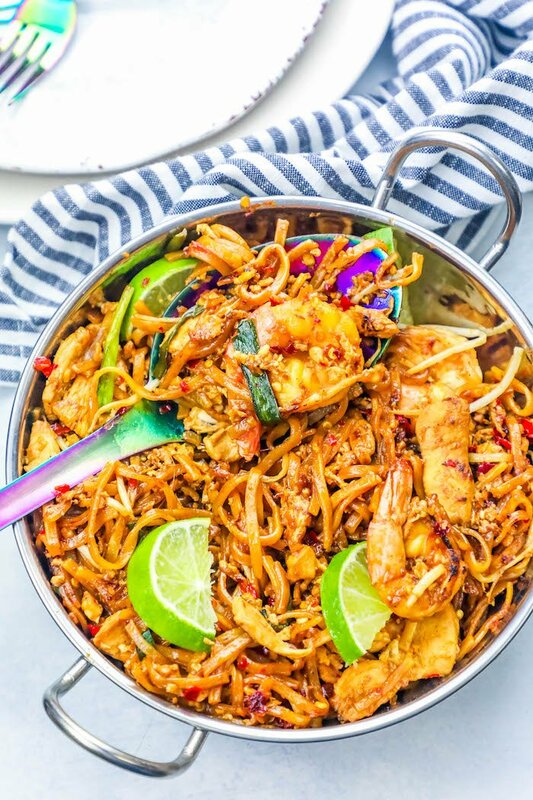 The Best Easy Chicken and Shrimp Pad Thai Noodles Recipe is a delicious, Thai food restaurant quality dinner that tastes just like takeout – in under 2o minutes for a meal bursting with Thai food pad Thai flavor that everyone loves! 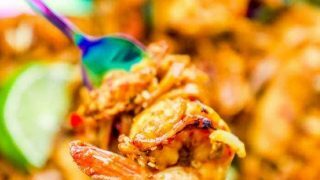 Keto Pad Thai and low carb pad Thai recipe notes included too. 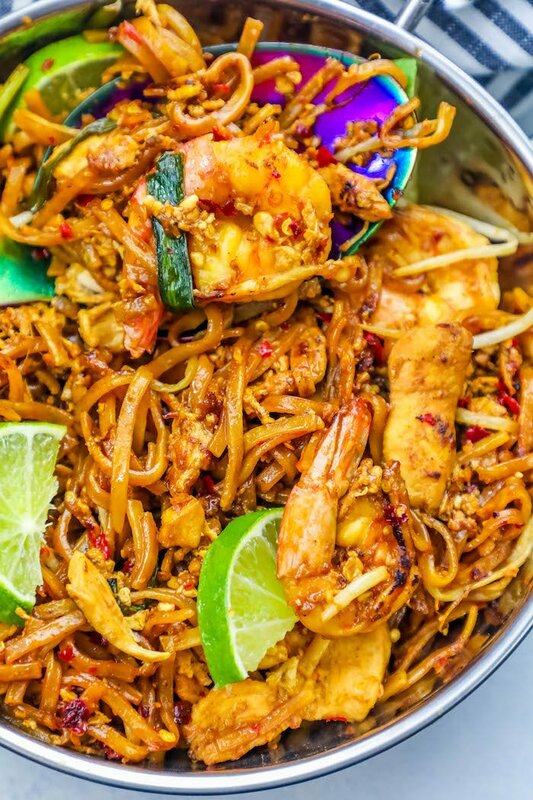 Pad Thai is one of my favorite takeout dishes of all time – I think I survived off it out of every couple meals in my 20’s. I always ordered chicken, shrimp, and extra Thai hot noodles when I needed something quick and filling fast. 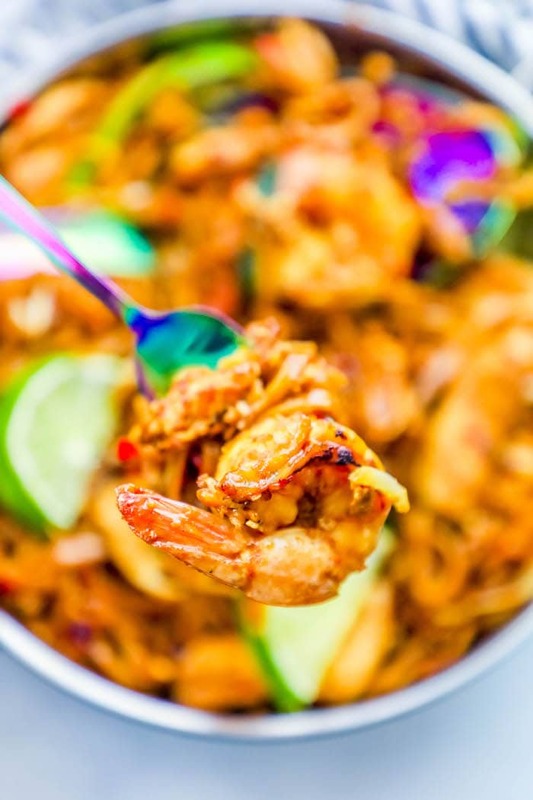 I love pad Thai with shrimp and chicken – and this recipe is just like my favorite Thai food restaurant, but fast, easier, and a million times more delicious! If you’ve been following my site for a while, you might know I am *trying* to stick to a low carb, keto diet after my husband lost a ton of weight doing keto. It has helped me lose weight, but more importantly, my joints feel much better when I am eating less carbs and sugars. While this dish is naturally gluten free (rice noodles are usually gluten free and safe for even celiac eaters), the rice noodle carbohydrates are pretty off a low carb eating plan. Luckily, this dish can easily work into a keto diet with a couple of low-carb vegetable noodle swaps! Ketchup can be loaded with carbs and sugar – find a low carb version to swap for the sugary stuff. Buy my favorite zucchini spiralizer here. Halve a spaghetti squash and scoop out strings and seeds. Bake halved and cleaned squash for one hour until tender, then run a fork along the flesh to create “spaghetti” noodles. Add to recipe when adding rice noodles to wok as listed below. Beet noodles are often available at grocery stores (I can always find them at Whole Foods) – simply add them when adding sauce to recipe below and cook until slightly tender. 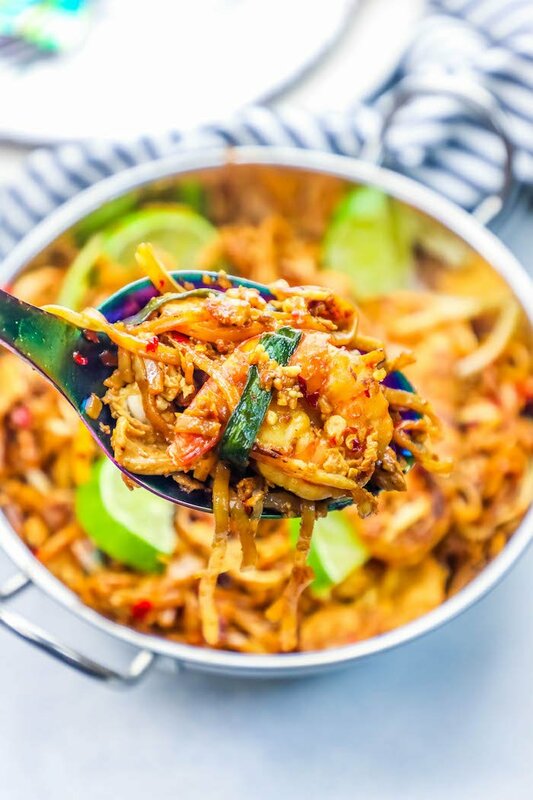 This pad thai is super simple and so easy – all of your cooking is done in one large pot or wok – but there are a couple of simple steps to make easy pad thai at home. This dish relies on hight heat to cook your dinner fast – don’t keep it low, or everything will boil and you won’t get the lovely, toasty flavors to develop. Use a big enough pan. Crowding your pad thai in a small pan makes it cook slowly – resulting in gummy noodles, soggy chicken, and bland vegetables. Give it room to cook at high heat and don’t crowd your pan! We’re counting on plenty of hot oil to make this recipe naturally nonstick – super hot oil makes your job easier! It also helps to form a slick sauce, so don’t cut back on the oil. Since we’re cooking this chicken and shrimp pad thai at high heat, it’s important to keep stirring to prevent burning or anything to become too charred. 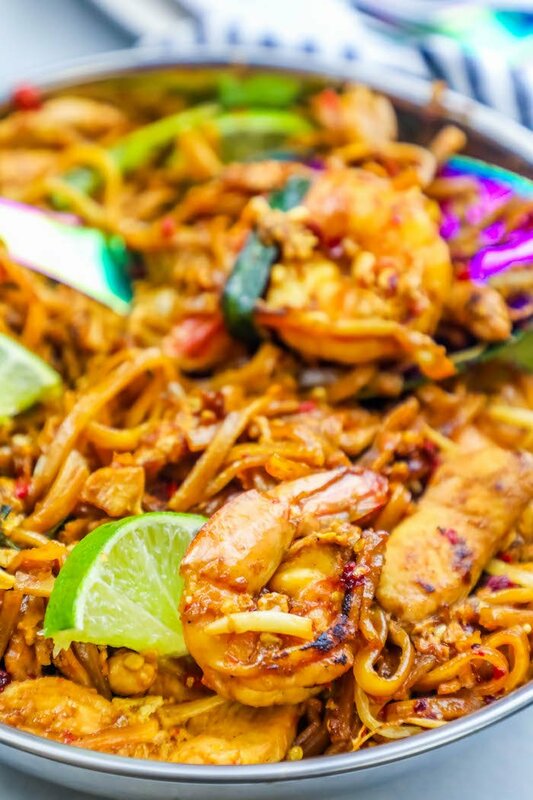 This easy chicken and shrimp pad thai recipe is great because you really don’t need any fancy equipment that you might not have on hand already. While a wok makes this recipe great – any large, heavy pan will work. If you love this Easy Chicken and Shrimp Pad Thai Noodles Recipe as much as I do, please write a five star review in the comment section below (or on Pinterest with the “tried it” button – you can now add pictures into reviews, too! ), and be sure to help me share on facebook! Place noodles in a large bowl filled with cold water and let soak while starting to cook. In a small bowl, mix together fish sauce, ketchup, Worcestershire sauce, chili sauce, and sugar - set aside. In a large, heavy pan or wok, heat peanut oil on medium high until shimmery. Add diced chicken to pan and cook until lightly browned, stirring often to prevent burning. Add garlic, shrimp, and red pepper flakes. Cook, stirring often, until shrimp is opaque and pink. Add sauce mixture and stir for another 3 minutes. Drain water from noodles and rinse well to remove any starchy water from noodles. Noodles should be slippery and soft. Add beaten egg mixture to chicken, shrimp, and sauce in pan, and stir constantly for 1 minute. Add drained noodles and toss until coated evenly. Add in cilantro, peanuts, bean sprouts, and green onions. Cook for 1-2 minutes until green onions are soft and pad thai has been evenly mixed. Spoon into large bowl or serving platter, topping with additional fresh chopped peanuts and cilantro, as well as slices of limes to garnish.